The FIDE official webpage reports all eight participants of the Candidates confirmed their participation in the tournament. Among those is Vishy Anand, who was undecided according to his several recent interviews. Yesterday was a deadline for making a choice. The event will take place from March 13 (starts Round 1) till 31 (tiebreaks day) in Khanty-Mansiysk. 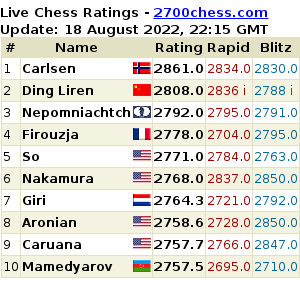 The winner will be Magnus Carlsen's challenger. FIDE website reports the next Candidates to be held from March 12 to 30. The venue is Russian city Khanty-Mansiysk. Only a month is left before the Candidates starts in Khanty-Mansiysk, the opening ceremony of which is scheduled on March 12. According to regulations FIDE should held the drawing of lots in the central office located in Athens exaclty a month before the competition starts. There are four Russian grandmasters participating which means they have to face each other in the 1st, 2nd, 8th and 9th rounds. Silvio Danailov told Chess-News Bulgarian Chess Federation will send a bid for the FIDE Candidates tournament which is scheduled to take place in March 2014. 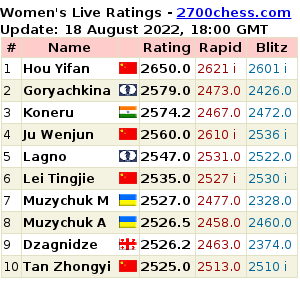 This will be possible only after FIDE will open the bidding procedure. Yet such a procedure is not opened, however, yesterday it was announced that Khanty-Mansiysk will also send the bid to FIDE to hold the competition. FIDE site has announced that the Federation expects official bids from cities wishing to host the Candidates Tournament next year (12-30, March). Khanty-Mansiysk has already sent its bid and it will be reviewed during the FIDE Congress in Tallinn in October. Perhaps the Bulgarian chess Federation will also send its official bid.